Having been a high school, community college, and 4-year coach at all three levels, I have had to deal with the dilemma surrounding how to make the best use of the dual hurdler, the hurdler who can go both ways. If your boys or girl can run 14.1 in the highs but can’t bust a grape in the intermediates, or vice versa, your choices for training are less complex. But what if your boy is 14.2 and 38.00, and your girl is 14.0 and 43.55? How do you give them all they need to perform at the highest level while still attending to the specific needs of two different events? First and foremost, it’s important to know how far you think this dual hurdler is going to go (District, State, National Scholastic, Junior Nationals, Junior Olympics, or AAU’s). Then you can formulate a plan for a 12, 15, or 20 week track season. This is a complex but not complicated plan. Complexity means that it’s going to take time for you to sit down and place all of your meets on a calendar, and then busy yourself trying to see how many days you can devote to developing speed, power, speed endurance, and special endurance. Max efforts of less than 7 seconds with a minimum of one minute of recovery for every 10 meters you run. So, if you have a great dual hurdler, the base for that girl or boy will be speed. Once you are able to establish a good speed base, you can then run more comfortably at a % of that top end speed. Power development in and outside the weight room will enhance your speed development (notice I said “development’ and not speed “work) capacity. The 200 meter race now becomes your best friend for the high and 300 hurler. The race will provide the short hurdler the speed endurance capacity and high enough power output to build on the short hurdle capacities. The 200 gives the long hurdler quality speed endurance to carry you through 300 meters since a 25.0 200 meter girl is 14% faster than the velocity of a 43.55 300 hurdle run . Using the meets to develop the special endurance is a great way to train that system under competitive conditions. Running both relays and both hurdles will give you a great training day as well as racing opportunities. The 300 race is a bit of a freak distance since the faster you run it, the further away you get from the real nasty lactate and discomfort you cannot avoid in the 400 hurdle race. If you live in a state where 400 meters your hurdle distance is, don’t abandon the 200, since it still a delivers positive impact on the short hurdles as well as under speed work for the longer race. You’ll just have to ramp up the special endurance work with some back to back runs (100-400, 200-800 doubles). Don’t cry about the races being too close since you wouldn’t normally give your kids even that much rest at practice. 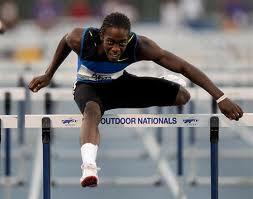 But the one area I failed to mention earlier is always train with the intent to protect the hurdle rhythm. Running both hurdles on the same day is not ideal but can serve to teach the dual kid how to flip the script from one event to the next. If you do have to train like that, then I would suggest you stay away from regular height and regular distances between the hurdles. Once fatigue becomes an issue, you diminish their ability to learn how to switch from short rhythm to long. Hydrate and then run over 3 lowered intermediates set at 9 meters for a 4 step rhythm and then stride for 10 meters, turn around and return over 3 hurdles. This is an aggressive day so keep it as far away from big races as you can. Tony Veney is the head track and field coach at Ventura Community College in Ventura, CA.